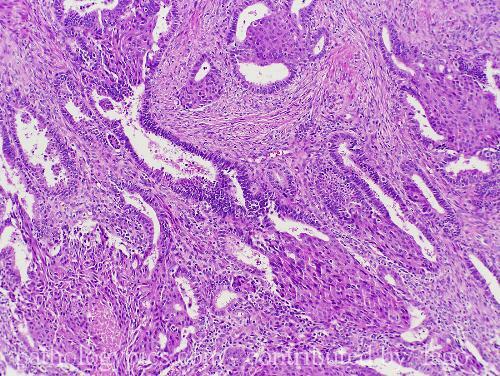 Additional Info: Atypical polypoid adenomyoma (APA) of the uterus is a rare tumor composed of atypical glands surounded by smooth muscle. Squamous metaplasia can occur. As seen in this image, distinguishing this lesion from true invasive adenocarcinoma can be a REAL challenge. Most APAs do not invade the myometrium, but rather have pushing margins. The glands are not surrounded by desmoplastic stroma but rather by smooth muscle. There are no overtly malignant glands in an APA. Typically these tumors occur in women of reproductive age. These tumors are considered benign. Iago - Another beautiful image of a difficult diagnosis. As you point out, diagnosing APA can be a real challenge. At first pass (at least to me) they look for all the world like a well diff adenoCa. I pointed out some things above that seem concerning for gland complexity or that have an invasive sort of feel... I wonder if you could comment? APA's are typically classified as benign...but a significant number are associated with usual type adenocarcinoma and there is a high recurrence rate after polypectomy. Some experts believe that they are actually very low grade polypoid adenocarcinomas. In a hysterectomy specimen, it doesn't really matter--the patient will be cured. In biopsies or curettings, however, it is important to note the possibility of associated adenocarcinoma and/or local recurrence. I usually suggest hysterectomy if there are not other contraindications.